A supernova such as 87A occurs when a star many times larger than our sun runs out of fuel in its core. At this point, the core is made of iron, and its fate hinges on the battle between two forces: Gravity tries to collapse it while electrons effectively repel each other, thanks to the Pauli exclusion principle, a quantum-mechanical effect. For a while, equilibrium is maintained, but the mass of the iron core keeps increasing, because of nuclear burning in the shell above it. Eventually, the core mass reaches a critical value called the Chandrasekhar limit, and the relentless pull of gravity wins. The core collapses on itself in near free fall, and a shockwave forms around it. Heated by the energy of escaping neutrinos, the shockwave ejects the outer layers of the star in a catastrophic blast that can briefly shine more brightly than entire galaxies. After losing its energy to neutrino emission, the core finally settles into what is known as a neutron star, effectively a giant nucleus made primarily of neutrons. By the time Duhalde and Shelton saw light from 87A, three neutrino detectors around the world had already picked up evidence of the supernova. Most of the energy released in a supernova is emitted as neutrinos, nearly massless subatomic particles that react rarely with ordinary matter. Because they are so weakly interacting, neutrinos can slip out of the envelope of a collapsing supernova hours before particles of light, which ride the explosion's shockwave, are ejected. Neutrinos produced by 87A arrived on Earth just before the light from the explosion did. Irvine-Michigan-Brookhaven (IMB), a neutrino observatory in Ohio on the shore of Lake Erie, detected eight neutrino events. Baksan Neutrino Observatory in Russia detected five more, and Kamiokande II, a neutrino detector deep underground in a Japanese mine, saw 11. It was the first time that neutrinos from a supernova had been detected – although the neutrino scientists didn't realize it until after Duhalde and Shelton announced their observation. They found the neutrino events in their data only when they looked for them upon hearing the news about the supernova. Something incredible waiting to be known? More than 30 years later, scientists are building the international Deep Underground Neutrino Experiment (DUNE), hosted by Fermilab. Its 70,000-ton liquid-argon detector will be located almost a mile underground at Sanford Underground Research Facility in South Dakota, waiting for another burst of supernova neutrinos to arrive. The discovery would portend a new exploding star somewhere in the Milky Way. Kate Scholberg, a particle physicist at Duke University, says supernova neutrinos could teach us a lot about supernovae and particle physics if we detect them the next time an event like 87A occurs. That's because the neutrinos carry information about the supernova with them as they travel across space. The signals the neutrinos make in particle detectors like DUNE would allow physicists to draw conclusions about the conditions in which the neutrinos were made and provide evidence for the fate of the exploding star. "You can actually see the processes that are happening in real time as the neutron star is being born," said Scholberg, who studies neutrinos as part of DUNE. These processes could point to new physics. For example, if exotic particles are produced in a supernova, traces of their existence would be apparent in the signal made by the neutrinos. That's because physicists can calculate the total energy produced by a supernova, and they can estimate how much of it was emitted as neutrinos from the measurement. If the total energy detected doesn't add up to the total expected, it could hint at new particles being produced. 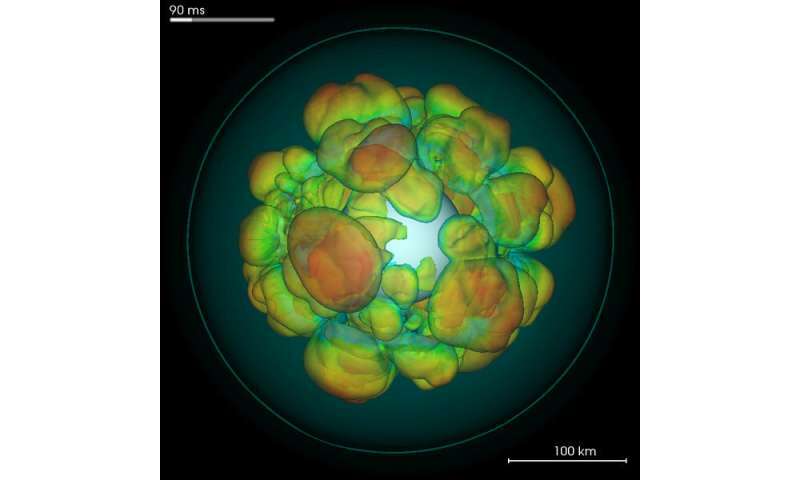 "The detection of a supernova in 1987 from Kamiokande was, to me, one of the most impressive detections for particle physics," said Inés Gil Botella, a scientist at Spain's Center for Energy, Environment and Technology, or CIEMAT, and one of the leads on DUNE's supernova search. "It opened a way to understanding the universe through particles other than photons. This new multimessenger era of astrophysics really started with the detection of supernova neutrinos." While detectors captured only 24 of the neutrinos emitted from 87A, hundreds of peer-reviewed papers were published as a result of the discovery and subsequent research. When DUNE is completed, it could see far more neutrinos and contribute to a similar – and entirely novel – flurry of research. "DUNE has several capabilities that are truly unique among all large neutrino detectors when it comes to studies of supernova neutrinos," said Steven Gardiner, a Fermilab scientist who works on simulating what occurs when a supernova neutrino enters a detector. DUNE is different from Cherenkov detectors such as Kamiokande in several ways, including that it uses liquid argon instead of water as the target medium. Liquid-argon detectors spot neutrinos when they collide with argon nuclei. Argon's nucleus is composed of protons and neutrons that are arranged in various energy states. When a neutrino collides with an argon nucleus, a proton or neutron in a lower energy state can be elevated to a higher energy state and lead to the emission of particles from the argon nucleus via its de-excitation. Some of these particles can be observed by the detector. "When the nucleus de-excites, a few different things can happen," Gardiner said. "The nucleus can emit gamma rays, neutrons, protons or heavier nuclear fragments. You can potentially see gamma rays in liquid argon, because they'll scatter electrons in the argon, and you'll see little blips that come from them." Cherenkov detectors, which look primarily for electron antineutrinos striking bare protons, can't reconstruct gamma rays with as much detail as liquid-argon detectors can. Because of the complicated nature of the energy reconstruction, it's quite a challenge to reconstruct supernova neutrino events in a liquid-argon detector. Gardiner is currently building computer simulations that can model the various signatures that can occur when a neutrino interacts with the liquid argon in DUNE. "The difficulty is, because you have so many argon excited states available, you have all sorts of different signatures that could be produced in your detector," he said. "And you have to deal with that level of complexity to fully reconstruct the energy from a neutrino collision." Then there's the challenge of teasing out the signal from the noise. Supernova neutrinos carry far less energy than, say, neutrinos produced by a particle accelerator, so the signals they produce in the argon are weaker. Unearthing these low-energy interactions requires both a sensitive detector and a knowledge of the interaction's various signatures. 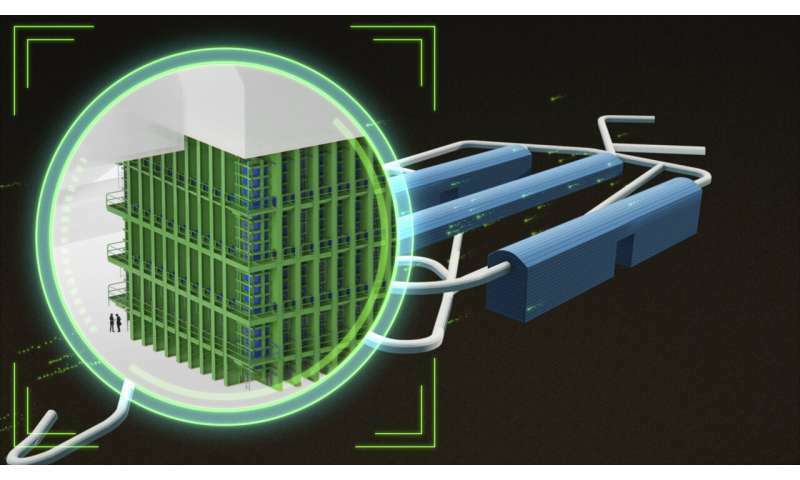 "High-energy neutrinos are easier to detect, and their interactions are well-known. We know how they behave," Gil Botella said. "But at these low, supernova-neutrino energies, the interactions with argon are not very well-known. We don't have much experimental data to say what happens when a low-energy neutrino interacts with argon." And scientists at the world's other neutrino projects are looking to change that, planning experiments that would paint a clearer picture of low-energy neutrinos. "Studying neutrinos is a tricky business, and we have more work to do, but DUNE's technological capabilities make those challenges far more tractable," Gardiner said. "The physics payoffs will be huge. If we're going to tackle these questions, DUNE is a good way to do it." DUNE could also help inform our understanding of neutrino oscillation in a way that other detectors cannot. In Cherenkov detectors, the signal is produced mostly by electron antineutrinos interacting with water molecules. Conversely, liquid argon also samples electron neutrinos from the supernova's ejecta. "We need both electron neutrinos and antineutrinos to disentangle oscillation scenarios," said Alex Friedland, a particle physicist and senior staff scientist at SLAC National Accelerator Laboratory in California. DUNE, because it will be the only detector that can see electron neutrinos, adds a missing piece to that puzzle. Neutrinos oscillate between three flavors (electron, muon or tau) as they move through space. Physicists have studied neutrino oscillations in neutrinos produced in the sun, in Earth's atmosphere, from nuclear reactors and in high-energy particle beams created by particle accelerators. But they haven't been able to study them in supernovae, where the number of neutrinos produced is simply off the charts compared to other sources. "This is the ultimate intensity frontier," Friedland said. "Nature does it for us, so we just have to take advantage of that. The supernova is a laboratory on the other side of the galaxy. It carries out experiments, and we 'just' have to build the detector and make a measurement. Of course, it's useful to keep in mind that this measurement 'just' happens to be one of the most challenging tasks that DUNE, the most advanced neutrino detector ever built, will undertake." Neutrino oscillation typically describes a single particle changing flavors, but under the right circumstances—such as in a collapsing supernova—many neutrinos can oscillate collectively. "Collective oscillation means that you have neutrinos that go through the background of other neutrinos, and a flavor state of a given neutrino knows about what all the other neutrinos that it passes are doing in terms of flavor," Friedland said. With enough neutrino signals – which a detector such as the giant DUNE could amass – physicists can reconstruct the energy spectrum of the electron neutrinos arriving at Earth. This spectrum can have striking features imprinted on it by collective oscillations of neutrinos inside the supernova. With that information, they can see how the neutrinos evolved collectively in the dying star. The information can give them clues about what happened to the star itself, as well. The neutrino density is so high in a core-collapse supernova like 87A that it affects how the star explodes. The shockwave of the explosion is propelled by what physicists call the neutrino-driven wind. Other core-collapse events might not produce a supernova that we can see easily from Earth, but we'll know they occurred when the neutrino detectors register a burst. "When a star collapses into a black hole, you likely don't get any fireworks," Scholberg explained. "The observers might see nothing, or just see a star wink out. Those kinds of events would be seen brightly in neutrinos." Once the DUNE detectors are in place, they'll be used to take measurements of neutrinos coming from Fermilab accelerators and wait patiently for a supernova to explode. This happens in our galaxy on average once every 30 to 50 years. "That's the drawback of the supernova neutrino world; we're always waiting," Scholberg said. "You better not miss anything." When it does occur, a core-collapse supernova will be a major event that will affect multiple fields of research, including particle physics and astrophysics. "It's so impressive: Supernovae produce a huge number of neutrinos, they travel such a long distance, and you get a signal directly from something that's kiloparsecs away," Gil Botella said. "It's really amazing to get access to information inside a star like that. It's the connection with the objects in the universe—the unknown of the universe." Members of the public can sign up to receive alerts from the SuperNova Early Warning System (SNEWS). The automated system currently includes seven neutrino experiments in Canada, China, Italy, Japan and at the South Pole. When neutrinos produced in a supernova reach Earth, SNEWS will send out email alerts to announce their arrival, which would captivate the research community. 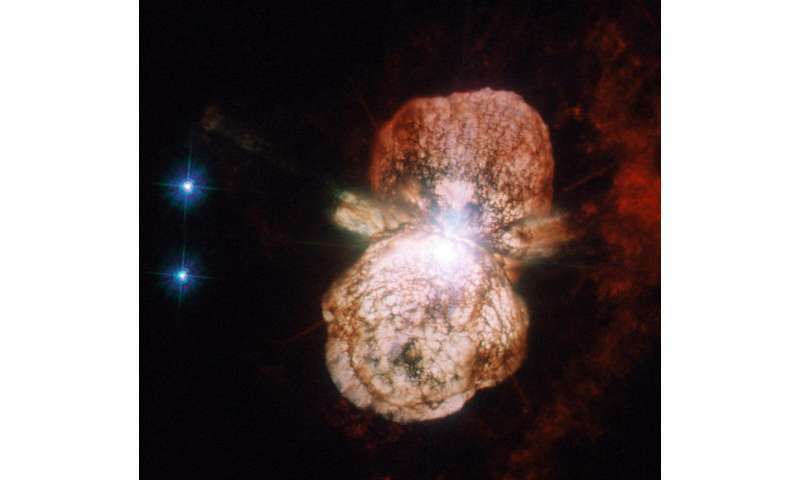 "Once the supernova happens, you can forget about everything else that we were thinking about," Friedland said. "The world of science will be talking about that for at least a year or more."